The Piano Concerto No. 20 in D minor, K. 466 is a piece of music for solo piano and orchestra. It was written by Wolfgang Amadeus Mozart between January and February 1785. 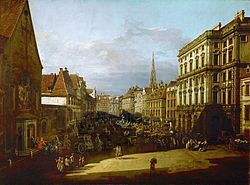 Mozart first performed the concerto in Vienna, Austria, on February 11, 1785. The concerto is very dramatic. It has always been popular with musicians and music lovers. The Piano Concerto in D minor was written by Mozart between the third week of January 1785 and February 10 of the same year. The next day, his father Leopold Mozart arrived in Vienna from Salzburg, Austria for a 10-week stay. That evening, Mozart performed the concerto at the Mehlgrube Casino. Leopold wrote his daughter Nannerl: "We arrived at 1 o'clock ... the copyist was still copying the new concerto and your poor brother did not have enough time to play through the Rondo because he had to supervise the copying ... On the same evening we drove to the first of his six subscription concerts. A great many members of the aristocracy were present. They each pay three ducats for these Lenten concerts ... Your brother is giving them at the Mehlgrube ... The concert was magnificent and the orchestra played splendidly ... A female singer from the Italian theatre sang two arias then we had the new and very fine concerto." Mozart played the concerto again at the Burgtheater on February 15, 1785. The Piano Concerto in D minor is a moody, chromatic work of passionate, troubled, and dramatic outbursts. The work was a favorite of 19th century musicians—in spite of its 75-measure "happy ending" in D major. Nineteenth century musicians typically did not like "happy endings" in intensely dramatic, turbulent works such as this concerto. 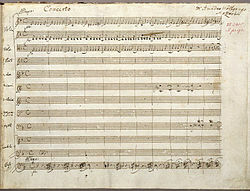 The Piano Concerto in D minor is the first of only two concertos Mozart wrote in minor keys. The other is the Piano Concerto in C minor. I. The D minor sonata form opening movement is an Allegro in common time. It has been described by critic and scholar Ethan Mordden as a furious struggle which does not resolve itself within the movement. This movement is forward looking, and anticipates the powerful soloist versusorchestra concertos of the 19th century. II. The second movement is a Romanza written in B-flat major and common time. It is a lyrical piece with a stormy middle section. It is an Andante, although it does not have a tempo indication. It is written in rondo form (ABACA). Just before the end, the music plunges into the key of G minor. III. The last movement returns to D minor. (Allegro assai; alla breve), and is one of Mozart's rare rondos in a minor key. The movement is written in an extended sonata-rondo form (ABACDA, with a coda). C is a development with the reprise in D. The development strays to G minor, but D major brings the movement to its close. Mozart did not write cadenzas for the concerto. His son, Franz Xavier Wolfgang Mozart, was a pianist-composer who had the concerto in his repertory, and wrote cadenzas for it. Beethoven also had the D minor concerto in his repertory though he did not usually perform the compositions of other composers. He did however perform the Piano Concerto in D minor several times. He wrote cadenzas for the first and third movements. In his cadenza for the first movement, Beethoven plunges the listener into a world of powerful, frightening, and intense drama. Mozart: Great Piano Concertos. Ashkenazy (cond. & piano), Philharmonia/1997/London 452958. Mozart: Piano Concertos 20, 23, 24, 26 & 27. Britten (cond. ), Curzon, English Chamber Orchestra/2001/Decca 468491. Mozart: Piano Concertos 20 & 23. Marriner (cond. ), Moravec, Academy of St Martin in the Fields/Haenssler 98142. ↑ 1.0 1.1 Harris 2002, p. 245. ↑ 2.0 2.1 2.2 2.3 2.4 Zaslaw 1990, p. 131. ↑ Mordden 1980, p. 105. ↑ 4.0 4.1 4.2 Woodstra 2005, p. 901. ↑ 5.0 5.1 Mordden 1980, p. 106. ↑ Woodstra 1985, p. 901.